Train and strengthen your entire body using this Gold's Gym treadmill. Includes four weight-loss workouts, designed to help you burn maximum calories so you can reach your weight-loss goals fast. The 1-pound hand weights add definition to your arms, shoulders and back. The indicator light on the GG480 console prompts you to use the hand weights so you can maximize your time. 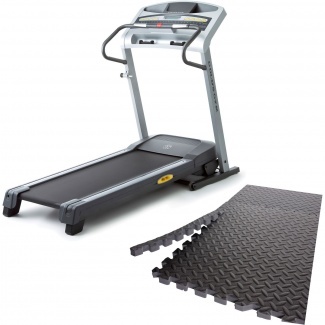 This Gold's Gym treadmill features AirStride Plus Cushioning, a uniquely shaped deck isolator. Gold's Gym puzzle mats are the perfect solution for those who want to protect floors or want a comfortable workout area. ToughTrain 3.0 out of 5 Have average features and available in a very reasonable price. *Note: Most of the sites, stores or shopping portals listed above sell Gold’s Gym GG480 Treadmill with discounts and other exciting offers. There is a possibility that the some of above websites are not selling Gold’s Gym GG480 Treadmill now. Toughtrain.com is not liable for such cases or instances. Also we do not recommend any seller for Gold’s Gym GG480 Treadmill and a buyer should buy from where he/she gets best deal with quality of products, service and on time delivery (shipment).